It’s also beneficial to find out what loan amount and sales price you qualify for before you start looking at homes. If you’re interested in getting pre-approved, click here to get started. Not ready yet, but have a few questions and want to learn more about the process? Please check out our website for a variety of information to help you as you prepare for your upcoming purchase. We’ll be there to help your through the entire process – from start to finish – every step of the way! Red Carpet, NOT Red Tape! It’s already time for all students to head back to school! It’s always a fun time of year hurrying around and making last minute changes to schedules, buying school supplies, paying tuition, and moving into a dorm or new apartment as we prepare for another school year. All of those expenses can mount up now, and even after you leave school if you’ve taken out student loans to help finance your education. For those that have student loans, there’s been one recent change in how the investors look at student loan payments when you’re getting qualified to purchase a home or are refinancing your existing home loan. Most investors typically will qualify you based on the current documented payment. If you’re still in school, the payments may be deferred until six months after you have either finished your degree or have left a fulltime status. Depending on the loan program, that payment may be ignored or it may have to be counted based on the amount it’s going to be after the deferment period. Some fields of study in which they are trying to attract more into their profession may have a forgiveness of student loans over time if you work in underserved areas. We see this occasionally with teachers. 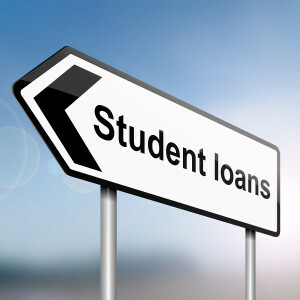 Other student loan financing plans may allow you to pay a lower than initially agreed amount based on your current income, and it’s subject to an annual review and adjustment. There’s even some student loan programs that allow interest only for a few years and then the payment will amortize based on the remaining term of the loan. As you can see, student loan repayment options vary greatly and the credit reports don’t always confirm all the information on the various payment options. The recent change we’ve seen with conventional financing is the requirement to qualify a borrower based on 1% of the student loan balance. So, if you have $20,000 in student loans, the monthly payment we have to qualify you on is $200 per monthly. That’s the worst case scenario where you would qualify. The only exception would be to provide acceptable documentation that the reduced amount is based on a fully amortizing loan with no payment adjustments. Acceptable documentation would be a copy of the student loan note that discloses the payment terms. When one investor makes a change, others are likely to follow. This change may not alter your ability to qualify for the home you’re looking at, but if you’re in the process of getting approved for a mortgage loan, do talk to your lender and make sure! If you think you’re going to be searching for home in the near future, make sure and locate your student loan note and include that information for your mortgage professional when you make application. It’s always a good idea to get pre-approved for a loan prior to your home search so that you can make sure you’re shopping in the right price range. Still have questions, give us a call. We would be happy to help you! You can rest assured that the First Mortgage Company team is here to help you through the entire process. Please visit our website to learn the Terminology associated with buying a home, What Happens in the Loan Process, What Types of Loans are available, and other helpful hints as you embark on this new adventure! If you’re ready to move forward and get pre-approved, here’s a link so that you can get started! We’re here to help you, every step of the way!